Ok, I got today Fujitsu ScanSnap S1500. Will keep you updated on my progress. For cutting I am using a circular saw with a 150 teeth blade. That's how pages look after sawing with 150 teeth blade. Is a circular saw the "right tool"? Has anyone tried this trick with a Dremel multi-max or a saber saw? Well... after spending for a ScanSnap, you may as well also spend for a paper guillotine. I'm very happy with the kind I got, a no-brand Chinese cutter, which you can find on eBay by searching for "guillotine paper cutter". Make sure you get the kind that not only has a blade, but also a little crank. The crank is to squeeze down on the text block. If you get a guillotine paper cutter without a crank, you'll end up with a paper cutter that can only handle a few pages. Actually, after a little research, I think the cutter is made by Yunguang Machine Manufacturing, model YG-858A3. Of course, you'll have to search for someone who just sells one (rather than a hundred)... such as on eBay. Whether you're using a saw, a paper guillotine, or (like me) still making do with a box cutter and a straight edge, you might as well remove the binder before you cut the spine. Just slice the end papers with an X-Acto or a razor blade, and the bound pages will come right out, leaving the binder intact. AAAAAAAAAAAAAAAAHHHHHHHH!!!!! MY EYES!!! THEY BURN!!! Why, dear gawd, why?!!! It makes me sad inside to see a book eviscerated so. Please, please, please.... build one of the second generation book scanners and stop the murder. iPad: Over it. Android FTW. I know it is painful to see a book chewed up like that, but sometimes there are legitimate reasons to do so. I started out bookscanning with a SnapScan 1500 and fi6130 and they are both awesome machines capable of very fast and accurate duplex scanning. Being the pack rat that I am, I had accumulated a whopping pile of books and magazines going back decades that I just couldn't part with, but that took up a lot of room. There are many books that I would never part with, but also many books that I would like to keep the content but don't care if I have the physical book ( magazines fit into this category). First I built a jig for my table saw to shear off the spine after removing the binding. This works, but the jagged cut edges of the pages can cause misfeeds on the SnapScan. It helps to fan the cut edges of the spine back and forth first before scanning to minimize pages sticking together. Then I bought a LARGE guillotine cutter that I use for anything less than about 100-120 pages long and the cut edges never misfeed. I found a used cutter for a couple of hundred dollars on eBay. I was able to cut and scan my way thru many decades worth of several magazines in about a month and many, many books and I cleared up loads of space in my basement. Now I'm building a nondestructive scanner for the books that I do want to keep, but also put on my iPad. rob wrote: Well... after spending for a ScanSnap, you may as well also spend for a paper guillotine. I'm very happy with the kind I got, a no-brand Chinese cutter, which you can find on eBay by searching for "guillotine paper cutter". I've looked at that option bofore settling down on a circular saw. For A3 size, I found one for $190 on ebay. That's pretty steep for me. spamsickle wrote: Whether you're using a saw, a paper guillotine, or (like me) still making do with a box cutter and a straight edge, you might as well remove the binder before you cut the spine. Just slice the end papers with an X-Acto or a razor blade, and the bound pages will come right out, leaving the binder intact. Will do that on few ones. Most of my college books don't need that though. Moonboy242 wrote: .... stop the murder. I found this book in the university dumpster. If anything, I am giving it a second life. BingBong wrote: I know it is painful to see a book chewed up like that, but sometimes there are legitimate reasons to do so. I have a storage full of books. There is just no way I can go through it on a daily basis to find a needed book or a page. To me it's about knowledge. Paper is just one of the ways to deliver it. With exception of a few books, I don't mind getting rid of them. That's after digitization. Moonboy242 wrote: AAAAAAAAAAAAAAAAHHHHHHHH!!!!! MY EYES!!! THEY BURN!!! A woman in our church died leaving a bookshelf full of Reader's Digest Condensed books to be thrown away. I snagged them figuring that though I'd never read them, they might make useful craft projects. So they did. I hollowed out five of them to give as Christmas gifts to my little nieces and nephews. I died just a little each time I started cutting the pages. I mainly cut up paperbacks, which generally aren't worth anything. I don't cut up hardbacks unless there's no choice -- like when it is cheap AND it would be very difficult to find another copy. All the books I have cut up and scanned are either duplicate copies I bought as I knew constant reference would wear out the first copy, or are cheap books picked up off of ebay or in charity shops. I would hate to be without books around me but see this as a way of having the books I need for reference in an easy searchable form saving time so I can read and enjoy the books I don't want to cut up. I also have room to collect more. The magazines I cut and scan are generally bought or I am given for the purpose. Last year I acquired over two tonnes of magazines and am happily ploughing my way through them. I don't feel any guilt about cutting them up as it is just an additional step in their original destiny of hitting the recycling, and if anything you can look on it as being the same as medical research. Before the body is interred, it lets up valuable information, which may prevent the early demise of someone else. By scanning my magazines that are not in the greatest of condition, a better set doesn't have to be broken up. I don't think I could take a circular saw to a book though - first off there is the mess, and secondly the cut isn't clean. 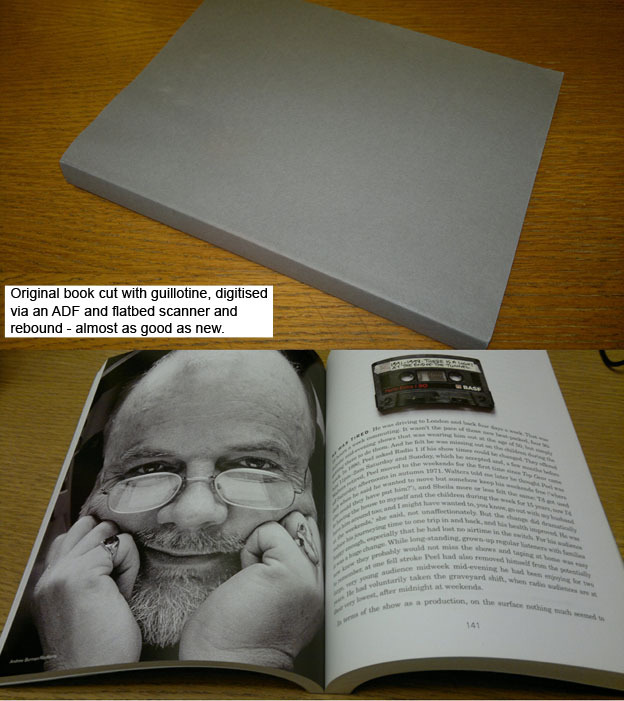 I have rebound some books I want hard copies of and there would be no chance of that happening with a sawn book.